In this tutorial I will show you how to build and use a flexible animation .swf for universal use (iPhone, iPad and retina display) with cocos2D-iPhone 2.0. I always use Adobe Flash to make games, whatever the support. Flash is an amazing tool for game developer: WYSIWYG layout, animation tool, vector graphics editor. Do you want to scale up you entire animation? No problem if you work with vector graphics. You can download the final AnimatedSpriteWithFlash.zip file. You need some tools and one Class made for Cocos2D in Objective-C.
Download and install the last Cocos2D-iPhone 2.0 libraries with templates in XCode. Download and install Adobe Flash. Download the AnimationSprite class from github. 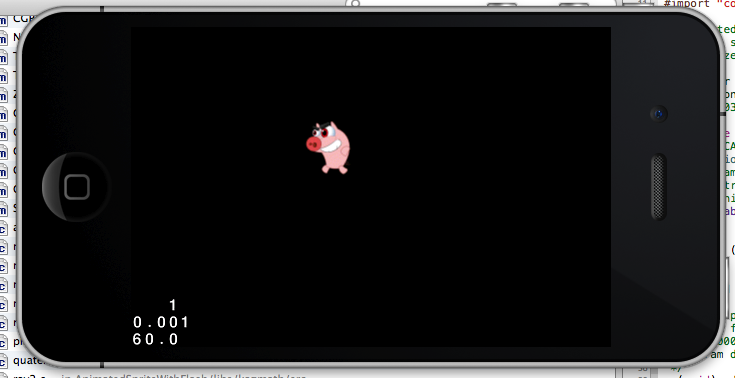 Open pig_walk.fla and pig_dead.fla with Adobe Flash. Then export you animation with CMD+Enter or CTRL+Enter for windows users. Flash will export a swf file in the same folder: pig_walk.swf and pig_dead.swf. Create a dummy cross in the middle of the sprite. Only for position reference purpose. Remove it before exporting your animation or set the layer as a Guide to hide it. Use the same stage dimensions for the same object. Use graphic symbols instead MovieClip. Because graphic animations can be exported with TexturePacker. Create one .fla file per animation. Always work for the iPad retina scale (2048×2048). May be you will export your project for iPad in the future :). Let’s use a default export for universal application with a compressed spritesheet altlas. AutoSD: set cocos2D ipad/hd/sd and hit apply. Save the file and hit Publish: TexturePacker will export 6 files, the pvr texture file with the plist database file for each scale (ipad/hd/sd). Set the Image format to RGBA4444 if you want to optimise your media. And Set the Dithering to FloydSteinbergAlpha (Better gradient effect with RGBA4444). Always work with the same framerate in your animations: Flash XCode. The max size is 4096×4096 for retina device and 2048×2048 for iPhone 3GS. But TexturePacker will adapt the max size. Create a new Cocos2D project template with XCode. Set iOS deployment Target to 5.1 at least. Add the AnimatedSprite.m and the AnimatedSprite.h files into your XCode project. Don’t forget to check the target. If you don’t use ARC in your current project set a flag in the Target > Build Phases > And set the compiler flag to the filename AnimatedSprite.m > –fojbc-arc. NB: By default the ARC is disabled. // Helper class method that creates a Scene with the HelloWorldLayer as the only child. // in this particular example nothing needs to be released. // don't forget to call "super dealloc"
Run and see the result. 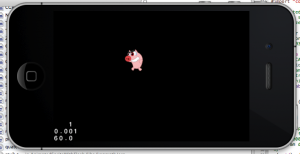 If you tap on the screen the dead animation will run and the pig will be removed. See the AnimatedSprite.h you will see all the public methods and public properties.